NASA had some big news this past week. No, it wasn’t aliens. It was the next best thing: the discovery of seven new “Earth-sized exoplanets,” a few of which could be hospitable to life. Now, it turns out that Elite: Dangerous actually predicted the existence of the TRAPPIST-1 star system where they’re located. Elite: Dangerous, the game you’re probably constantly hearing about but have perhaps been too intimidated to play, is a large-scale space trading simulator. Players explore and trade goods inside a 1:1 scale open world galaxy based on the real Milky Way, leading to any number of strange and uncanny experiences, like playing Grand Theft Auto in space. But to generate its numerous star systems and other cosmic phenomena, the game’s Stellar Forge engine takes the total measured matter for our galaxy and allocates it between known objects and other, procedurally generated ones. Using some of the leftover “unaccounted mass,” the game, unprompted, created a star system very much like TRAPPIST-1. “The way Stellar Forge works is to use ‘available mass’ from which to generate systems – and because of this unaccounted mass, Stellar Forge has created a system with a Brown Dwarf in very nearly the same place – 39 light years away – this is only a little smaller than an M8 – and it even has seven terrestrial worlds around it – Core Sys Sector XU-P A5-0. 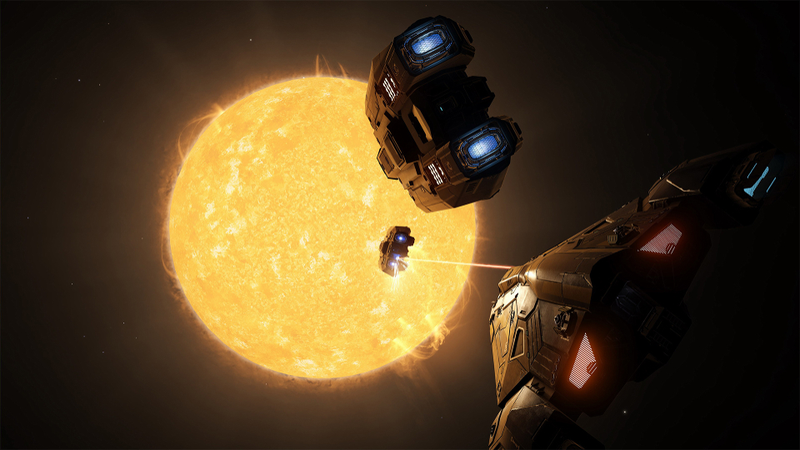 As a result of this collision between reality and simulation, Braben said the game will be updated with the data from the recent discovery to make Elite: Dangerous’ version of the star system identical. It will even be officially named TRAPPIST-1 and added to the game in its 2.3 beta. “The great thing is it is only a small tweak!” wrote Braben. NASA’s original reveal of TRAPPIST-1 and the planets orbiting it was big news in part because of its implications in the ongoing search for extraterrestrial life. “Finding several potential habitable planets per star is great news for our search for life,” the Director of the Carl Sagan Institute at Cornell University told Gizmodo last week. But while the search for alien life in the cosmos continues, it’s already been discovered in Elite: Dangerous. An Xbox One player discovered a giant, magnolia-looking UFO in the game earlier this year. Despite already being out for a couple years, the first sighting didn’t occur until last month, a testament to the game’s methodical approximation of real-space and the slow-burn satisfaction of encountering its hidden wonders. Only time will tell if Elite: Dangerous’ alien life is as predictive of its original approximation of the TRAPPIST-1 system.